I was very fortunate to get another opportunity to explore the north-western corner of Zambia in November this year . 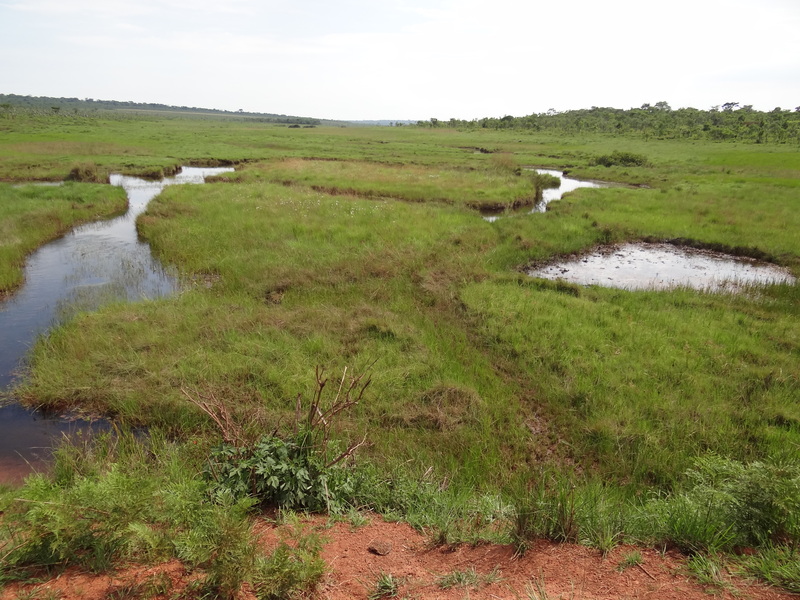 The trip was planned so as to experience this region in rainy season ( total rainfall is 1500 mm per annum ) and experience the influx of birds , insects and abundance of plant life . 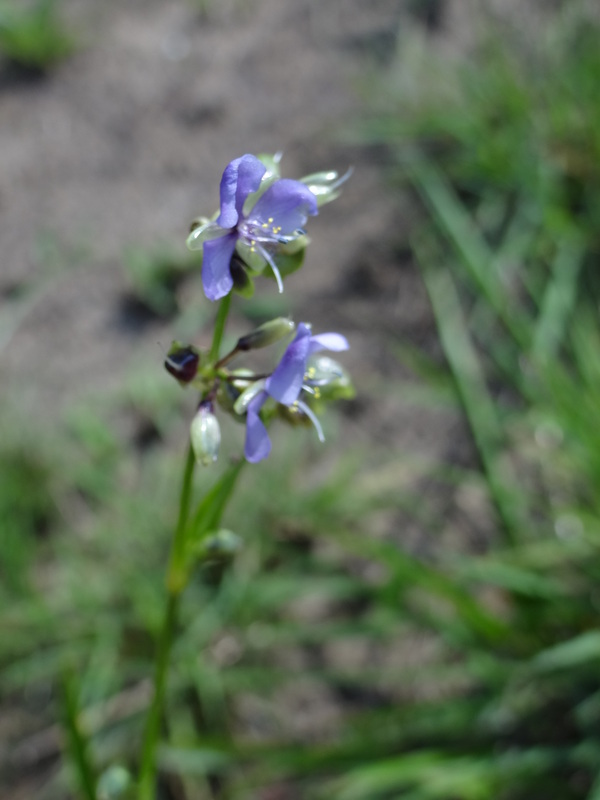 We spent 2 days driving up through from Lusaka , entering theKafue National Park , which was an exciting first for me and then exiting the north of the park we overnighted at a self catering lodge on the border of the West Lunga National Park , an amazingly wild , pristine park .We could only see into the area from across the …… river . Our trip started from Lusaka , the capital of Zambia , departing at 9h30 in the morning and traveling through Mumbwa , arriving outside the Kafue National Park at about 12h30 , our destination being Mukomba Camp , which is a very rustic self catering facility . We had two vehicles and a trailer .we entered the park through the Nalusanga Gate on the eastern side of the park . The travelers consisted of myself , Rory McDougall and Doris , the others being Mark , his son, Ben and Ernest ( the maintenance person ) .So six of us in all . This was a very peaceful setting outside the Kafue Park , but ion the river , so we looked across into the park . We heard lions not very far away when we were there and Rory was lucky enough to drive past a pride that was lying next to the road when they were driving into the camp, late evening . While waiting for Rory to arrive we saw a large bull elephant come down to the river to drink , and browse , he had much larger tusks than l expected fro this area and it was a pleasure to watch him from about thirty metres away browsing in a very relaxed way . This morning we were on a mission to get to the West Lunga National Park boundary , where we planned to sleep at another self-catering facility called Kabompo River Lodge , situated outside the West Lunga National Park , with a great view of the Kabompo River flowing lazily by at that time of the year . Waking up next to the Kafue River was a treat , great sunrise and crocodiles patrolling the shores looking for opportunities to feed , very active bird life also . By 7h30 we had departed on our long journey through the Kafue National Park going north . 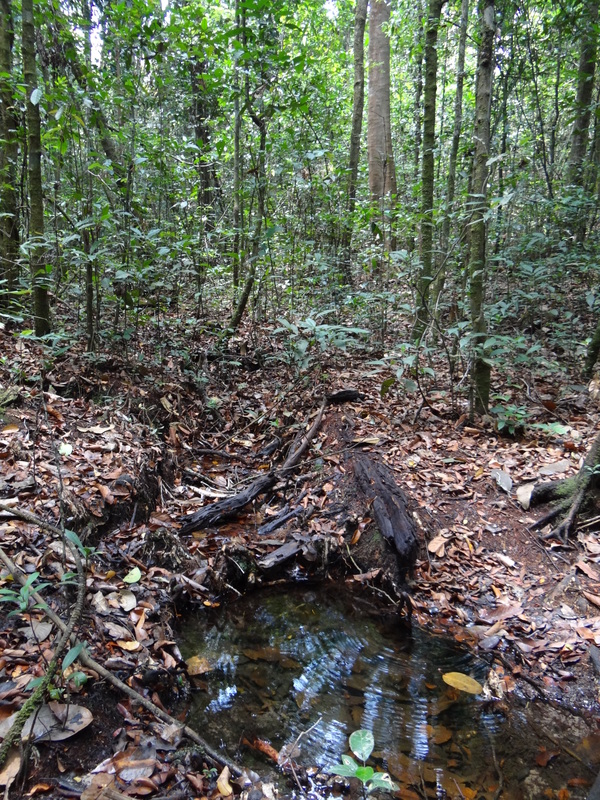 The area is dominated by vast miombo woodlands . 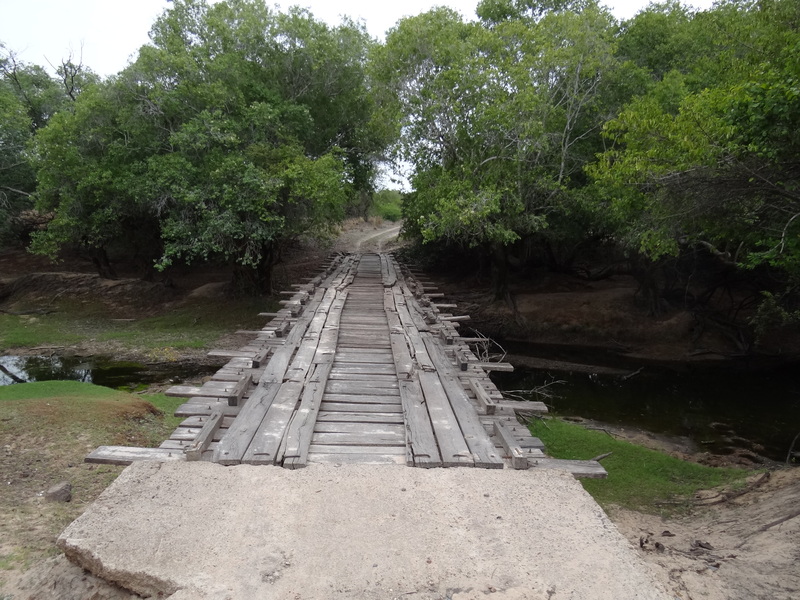 We crossed the “Hook Bridge ” over the Kafue River and then signed in at the gate going north through the park from the main road . It had been raining before we arrived and the road was muddy but passable ( fortunately it hadn’t been raining more or it would have been much more difficult to get through the park ) . 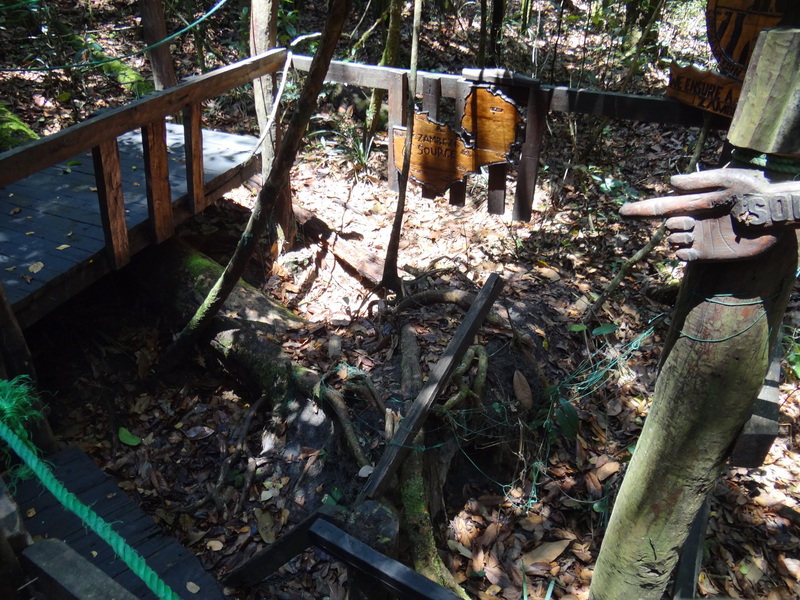 We continued north towards the Lufupa area and crossed the Moshi bridge ,which is a collection of planks , some bolted to the main steel frame and most not . Interesting crossing which was actually quite adventurous . We then exited the park through the most northerly Kabanga Gate after about 6 hours on the road . The road after this was very hard going , very uneven , we took one hour to cover 20 km . This is where one of the springs from the trailer broke . Next town along the way that we stopped in was Kasempa , where we were able to get fuel . This was a relief as we didn’t know what the fuel situation was going to be as we became more remote . Finally arrive at Kabompo River Lodge at about 18h00 ( we left at seven clock the same morning ) . This is a self catering facility that was only geared for sleep over , no kitchen , dining room area was available . Fortunately we were self-sufficient , so this wasn’t a problem . There wasn’t much opportunity to look around here as it was more of a pit stop on our main journey to Cassins Camp along the West Lunga River. We heard a wood owl calling from the trees around the lodge , and l had a very brief sighting of a male pennant-winged nightjar . GREAT VIEW FROM KABOMPO RIVER LODGE LOOKING INTO THEWEST LUNGA NATIONAL PARK over the Kabompo River. We had a cooked breakfast and left Kabompo River Lodge by 8h30 . At this stage we were 717km from Lusaka where our journey started . We stopped in the forest for a bite and a chance to see Perrin’s Bush Shrike , which we heard calling , but were unable to spot it . We did see trilling cisticola . The Bar-winged Weaver and Margret’s Batis could not be found .The mopane bees in this area made the stop very uncomfortable and we eventually moved on after the sheer numbers became unbearable ( these are stingless bees that go for moisture wherever they can find it ) . After leaving our picnic spot we carried on through to Mwinilunga Town , reaching there at about 10h15 . 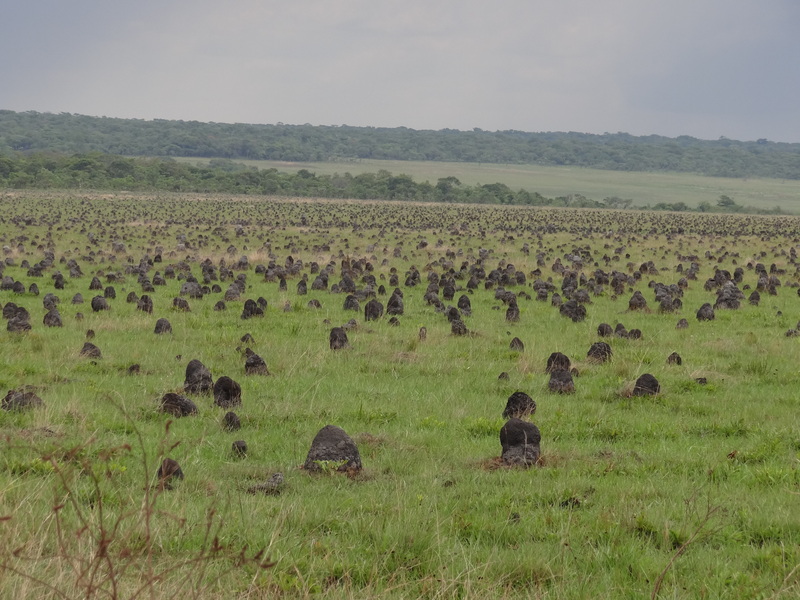 The termite mounds we have been seeing are huge , l am not familiar with the species that builds them , but have heard they are one of the Macrotermes sp. 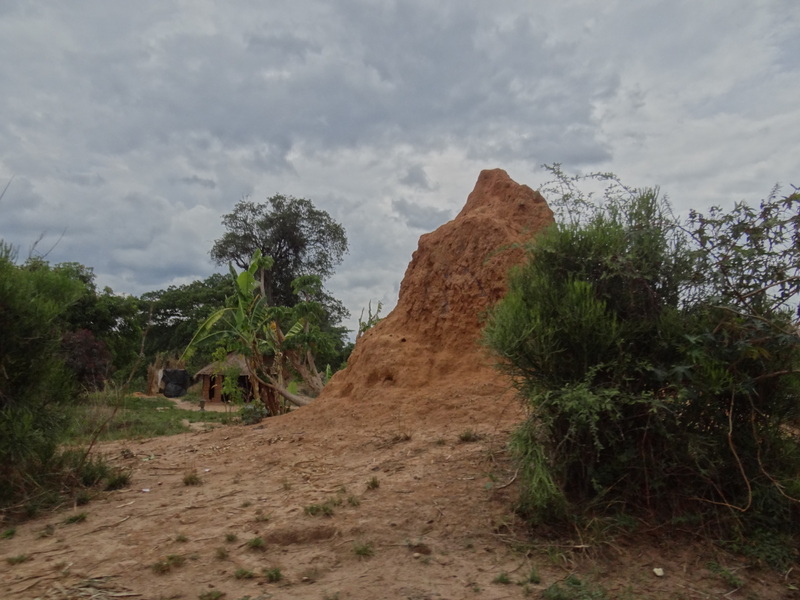 , which are the fungus growing termites . We wake up at Cassins Camp on the banks of the West Lunga River . What a pleasure to begin the day with a cacophony of bird songs , and the feeling that we are the only ones in the area . Cassins Camp is in the Nkwaji Conservation Area , it is part of a private wildlife estate that is 15 000 hectares in extent . 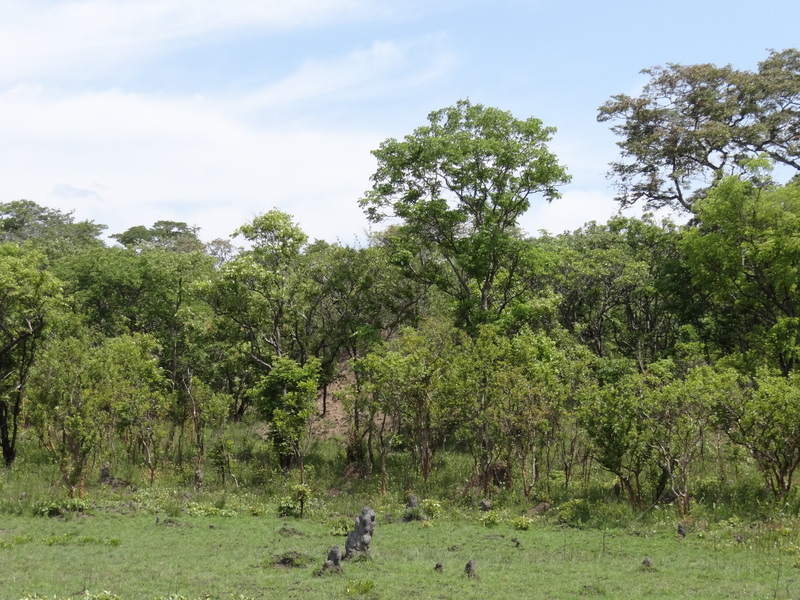 An area dominated by miombo woodlands , but also having Mushitu Forest and open dambo areas thus allowing for a tremendous amount of diversity of species whether plant , bird or mammal . The variety of bird calls is too much for me to assimilate and l just enjoy the scenery with the tall riverine trees and the mist . Dew covers the ground with a white carpet . Rory tells me l can hear the bamboo warbler calling ( which he describes as a person sewing away on an old style sewing machine ) , as well as the Rosss turaco , Trilling cisticola . l recognize the call of the Narinas Trogon coming from the woodlands behind camp. 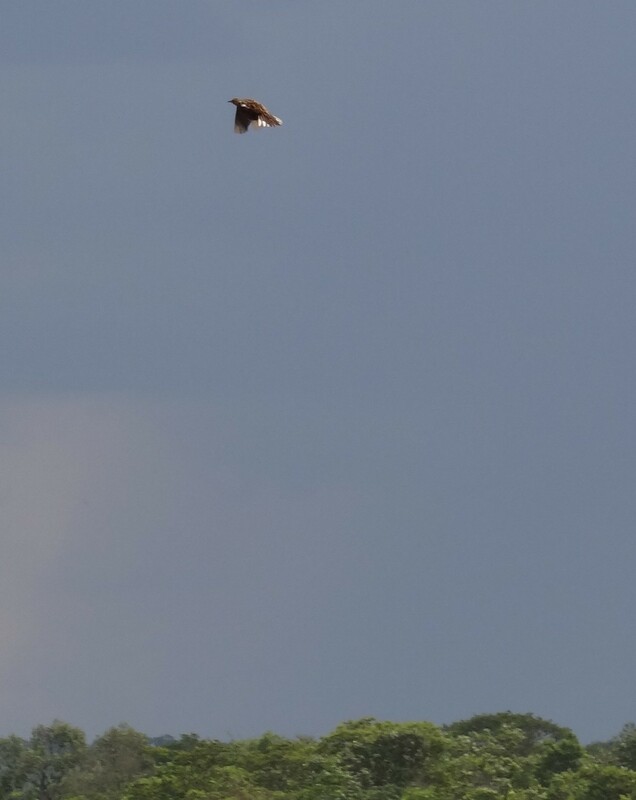 We eagerly grab our cameras and bird calls and track it down , within minutes it is circling us and we get a chance to see and photograph this jewel of a bird . 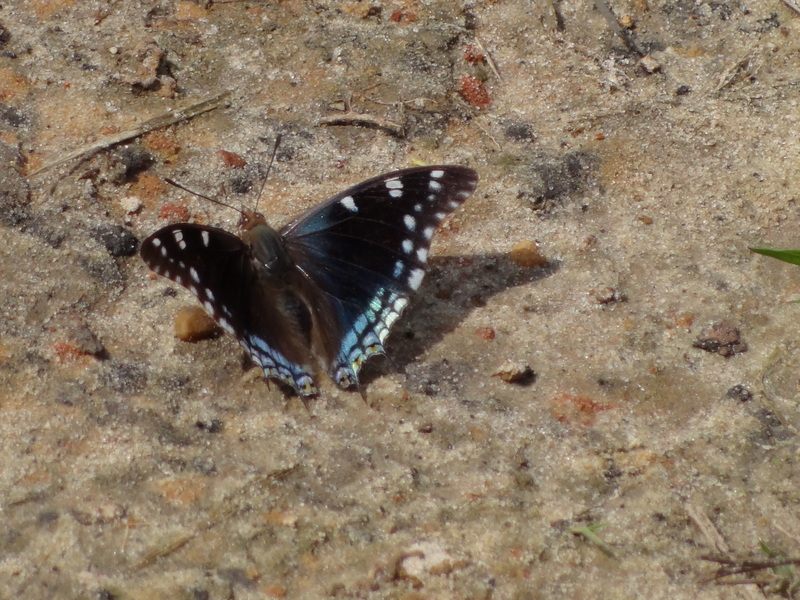 I spent quite a long time photographing various species of butterflies that are constantly patrolling the shoreline of the river . Today is spent checking the small boat and 3 seater canadian style canoe that belongs to the camp . 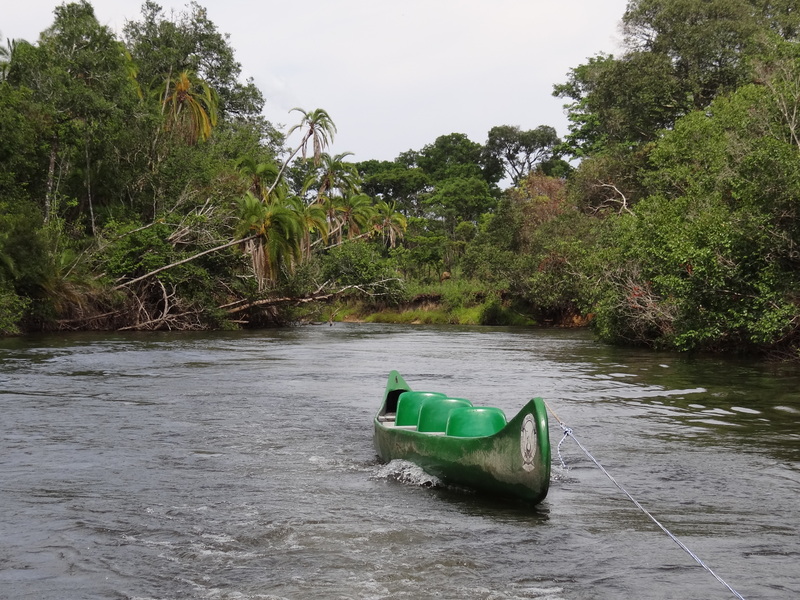 One of the primary goals of the trip is to establish whether the West Lunga River can be safely explored from a canoe . This turned out to be much more enjoyable than l had anticipated . The water at this time of the year is quite low , so l imagine the current would be a lot stronger in the rainy season (from October to April ) . This area has an average per annum rainfall of at least 1374 mm (54 inches ).We also drove to an area downstream where the game scouts had mentioned a possible exit site for the canoes . It is not easy to exit at random as the trees and bank are mostly very high . By ten o clock in the evening l am in bed , after a very satisfying day exploring the area . The loud calling of various frog species to send me off to sleep . The diversity of frogs is incredible , with 56 species having being identified from Hillwood Estate , which is the sister property to Nkwaji and about 90 minutes drive northwest of our position . This morning we woke up to the usual misty scenery and the West Lunga River gently flowing past . A cup of tea with friends and the ever present bird chorus starts a great day . This morning we get the canoe and safety boat ready for an expedition upstream . We leave after breakfast , slowly dragging the canoe behind the boat . 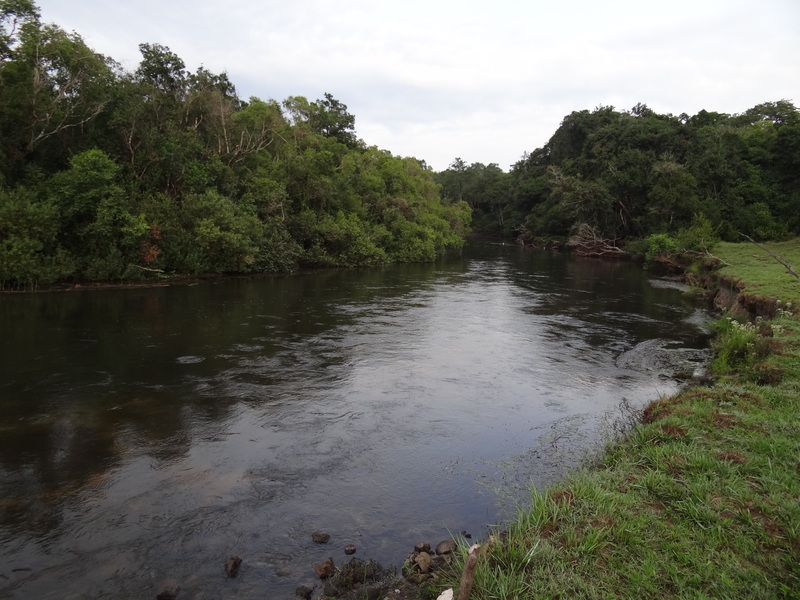 On the way up we see a green snake crossing the river, which disappears before we can identify it and further up a large water monitor lizard rushes across the river . There are hippos and crocodiles in the river somewhere. We never know what to expect around the next corner . The West Lunga flows into the Kabompo River which itself carries on into the Zambezi River . Being on the river here is simply stunning . 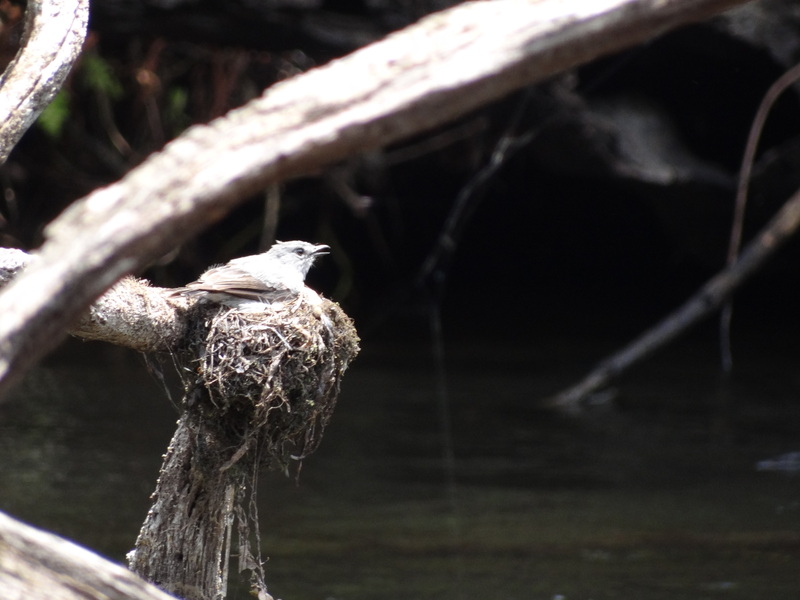 We spot a pair of Cassins Grey Flycatchers in a very localised area and closer inspection reveals a nest , which has two eggs in it , on a log overhanging the water .This is about one kilometre upstream from camp .Im looking forward to canoeing past it on th way down so l can get a closer look at the nest and maybe a photo of the eggs . 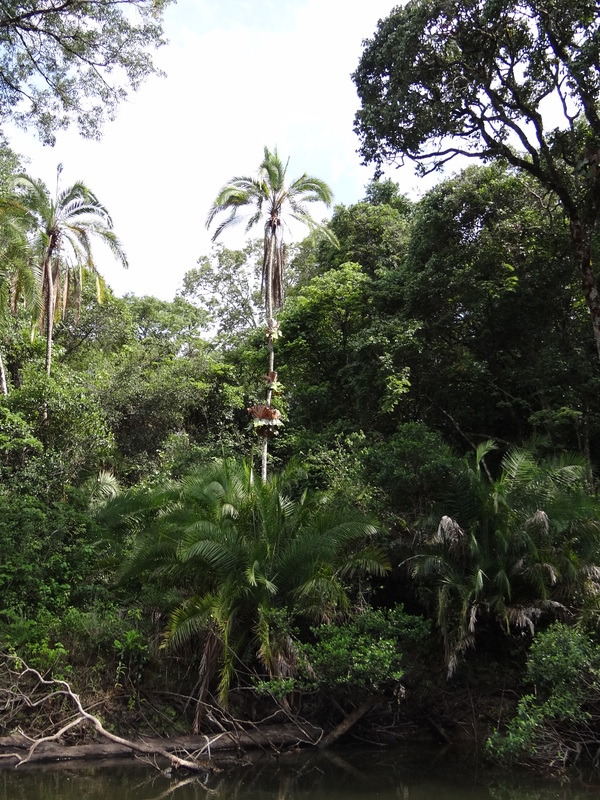 Many of the trees in this area have large ferns on them and many different species of orchid are to be found without much effort . The canoe trip back to camp was very leisurely and took about 2 magical hours . This m0rning we are going to see the source of the great Zambezi River , this has a special attraction for me as l have been living and working on the Zambezi most of my adult life and to see where it all begins is awesome . I have been here before a few years ago when l first came up with Rory to survey his camp site ,it has a mystical feeling about it as it flows through the narrow stream in the forest . This is a place that has to be experienced at some time in your life .